How much would James Bond’s number plate cost? Our research discovered estimates for famous number plates from films and TV series. Ever wanted to drive a car like James Bond but been put off by the expensive price of an Aston Martin? If that’s the case, then you’d think a more affordable option might be to buy the number plate of such a famous vehicle. However, recent research has found the cost of famous licence plates from TV and the movies could be worth a lot more than you would otherwise think. JB 007 would set you back nearly £130,000 for example, and that’s not even the most expensive one! With the new 67 number plates being released at the start of September, we conducted some research into how much the number plates from iconic film cars would cost in the UK today. The research was conducted by using the average cost of number plates according to the amount and combination of letters and numbers to calculate an estimate. 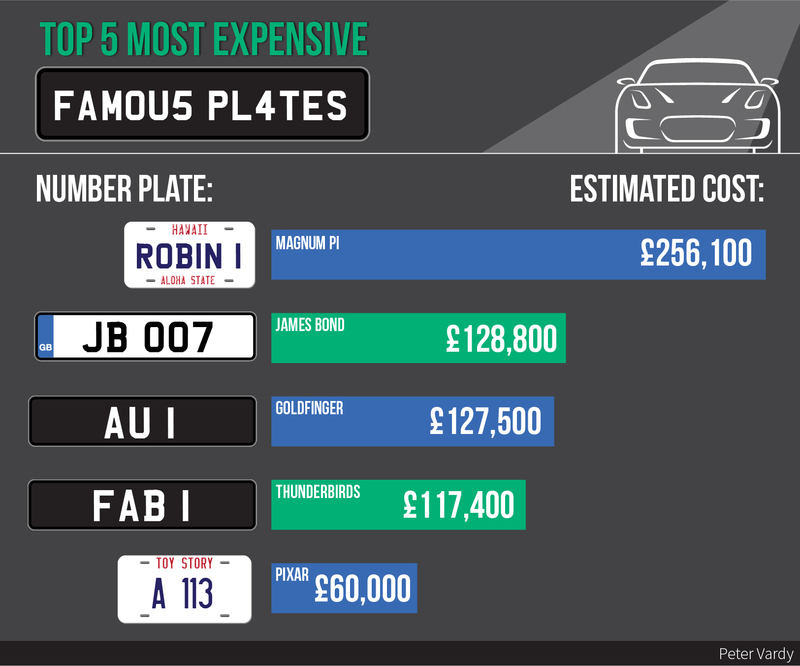 While James Bond’s number plate of JB 007 would cost £128,804 for a British driver to have today, it still wasn’t the most expensive famous plate from those analysed. That accolade goes to ROBIN 1 – the famous number plate for the car from American crime drama series Magnum P.I. It would cost a massive £256,100 in the UK today, not far off from the price of a Ferrari 308 GTS, like the private investigator was often seen driving. As the below graphic shows, there is quite a range in price differences for some of the most popular number plates from famous film and television cars. For example, Lady Penelope’s pink Rolls-Royce FAB 1 plate from Thunderbirds would set you back around £117,500, compared to just £5,000 for the Delorean’s OUTATIME plate from the Back to the Future trilogy. Chitty Chitty Bang Bang’s GEN II would be just under £10,000 while ST1 from The Saint is also at the higher end, at about £126,000. If you’d rather save some money for your actual car then MZ BLOND could be the one for you. From the Legally Blonde films, it had the lowest estimated cost of £2,268, of all the research conducted here at Peter Vardy. Other popular options could be STARK 4 from the Iron Man movies, at around £54,000 and PSY WGN from Kill Bill at £13,600. The research was conducted ahead of the release of the new 67 number plates, though among the most popular plates featured in film and TV, there were none that include the numbers 67. Hamish Livingston, Digital Manager of Peter Vardy, said: “Many of our favourite films leave us wanting to be just like the characters, from taking on their characteristics to longing after the material possessions we see the characters with on screen. There are plenty of other options from films that you could go for too, such as ECTO 1 from Ghostbusters, NRVOUS from Ferris Bueller’s Day Off, GADGET from Inspector Gadget and many more. While 67 may not be in any of these, should the number hold a special, personal meaning, you may be able to find appropriate new 67 number plates that suit you when they are released.